An ancient horse burial at Tombos along the Nile River Valley shows that a member of the horse family thousands of years ago was more important to the culture than previously thought, which provides a window into human-animal relationships more than 3,000 years ago. The research findings are published in Antiquity. The Tombos horse was discovered in 2011, and members of the Purdue team - professor Michele Buzon and alumna Sarah Schrader - played a part in the excavation and analysis. The horse is dated to the Third Intermediate Period, 1050-728 B.C.E., and it was found more than 5 feet underground in a tomb. The horse, with some chestnut-colored fur remaining, had been buried in a funeral position with a burial shroud. 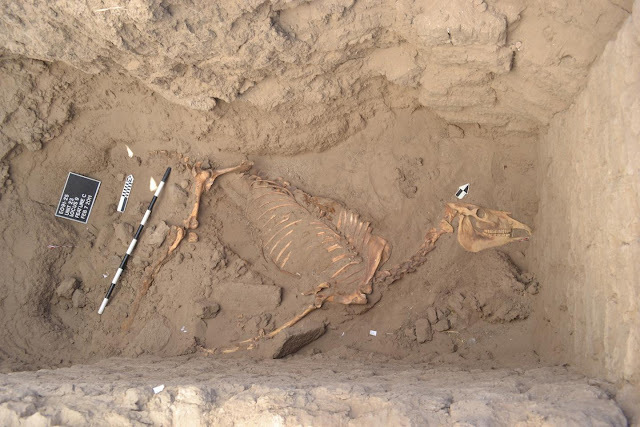 "It was clear that the horse was an intentional burial, which was super fascinating," said Buzon, a professor of anthropology. "Remnants of fabric on the hooves indicate the presence of a burial shroud. Changes on the bones and iron pieces of a bridle suggest that the horse may have pulled a chariot. We hadn't found anything like this in our previous excavations at Tombos. Animal remains are very rare at the site." Buzon, a bioarchaeologist, has worked with Stuart Tyson Smith, anthropology professor at the University of California, Santa Barbara, for 18 years at this site in modern-day Sudan, and both are principal investigators on the project. Buzon uses health and cultural evidence from more than 3,000-year-old burial sites to understand the lives of Nubians and Egyptians during the New Kingdom Empire. This is when Egyptians colonized the area in about 1500 B.C. to gain access to trade routes on the Nile River. Over the years, hundreds of artifacts, including pottery, tools, carvings and dishes were unearthed at this burial site for about 200 individuals. "Finding the horse was unexpected," Schrader said. "Initially, we weren't sure if it was modern or not. But as we slowly uncovered the remains, we began to find artifacts associated with the horse, such as the scarab, the shroud and the iron cheekpiece. At that point, we realized how significant this find was. Of course, we became even more excited when the carbon-14 dates were assessed and confirmed how old the horse was." Schrader, who graduated from Purdue in 2013 with a doctoral degree in anthropology, is an assistant professor of human osteoarchaeology at Leiden University in The Netherlands. Schrader is lead author on this article, and she helped frame this find within the context of Nubian history. Once the archaeologists discovered the horse, Sandra Olsen, curator-in-charge at the Biodiversity Institute and Natural History Museum at the University of Kansas and a well-known ancient horse expert, was invited to Purdue to analyze the horse skeleton. Buzon coordinated the analysis between the team, and she established the chronology of the horse via radiocarbon dating. "The horse was treated well in life, seeing as how it lived to a mature age," Schrader said. "It also was important to the people of ancient Tombos because it was buried - a rite that is usually reserved for humans. Furthermore, the fact that one of the earliest pieces of iron from Africa was found in association with the horse reiterates how special it was to the people. It is also important to assess the context of Tombos with regard to the horse - the horse is an important and rare find. The fact that it is buried at Tombos indicates that this town may have served an important function in the post-colonial Napatan Period."